Each morning, I look forward to my cup of coffee. Don’t you?? In the winter, a warm mug of soothing, cozy coffee to start the day, and in the summertime, a tall glass of iced-coffee to keep cool & caffeinated. To make that cup o’ joe extra special, I LOVE adding some chocolate. A creamy mocha treat. MmMmM. Growing up, I worked at an ice cream stand– Kimball Farm, the best ice cream of all time, btw– and coffee oreo was my favorite flavor. The earthy, bittersweet coffee blends perfectly with the decadent chocolate. With that in mind, I wanted to create a dessert that would let those flavors shine. A bar that is easy to eat, share, and bring on-the-go. Think– your afternoon pick-me-up. Right?! I don’t know about you, but 3pm is when I start to go for the snacks and treats. This certainly qualifies as a treat, and it doubles as a caffeine boost! That’s right, there is real caffeine in these bad boys. Instant coffee in the batter adds a strong coffee flavor. Plus, I made chocolate covered coffee beans and sprinkled those on top. Yessss this was the first time I made chocolate covered coffee beans. I used to buy them from Trader Joe’s, but figured, why not make them?? I got the dark roast Trader Joe’s brand coffee beans (which are delicious) and Trader Joe’s milk and dark chocolate bars. Melt the chocolate, add in the beans, and then remove them to a sheet of waxed paper to cool. Boom. The bars are thin, which is intentional given how rich they are; however, if you want them to be thicker, feel free to use a 13×9 inch pan instead of a 15×10 inch pan. 1) Preheat your oven to 350 degrees F. Line a 15×10 inch baking sheet with aluminum foil. Spray the foil with nonstick cooking spray. Set it aside. 2) Mix the 3 Tablespoons of instant espresso with 2 Tablespoons of boiling water. Stir them together well until the powder is fully dissolved. Set aside. 3) In the bowl of your stand mixer, or a large bowl with electric mixer, beat together the butter and brown sugar on a medium-high speed until it’s fluffy, smooth, and creamy– about 5 minutes. 4) Add in the egg, vanilla, and salt and mix again until fully combined. 5) Add in the espresso mixture and mix it in slowly. Then, with the mixer on the lowest speed, gradually add in the flour, 1/2 cup at a time, until all 2 cups are in there. 6) When the flour is mostly incorporated, add in the 1 cup of semi-sweet chocolate chips and mix just until combined. 7) We’re done with the mixer! Finish mixing the dough by hand with a wooden spoon or spatula if needed. Then, scoop the dough out onto the baking sheet. Press the dough into the pan. It’ll be thin, but there’s enough, I promise. I usually use my hands. The dough is sticky so it’s tough to do with a spatula or spoon. 8) Bake the bars in your preheated oven for about 15 minutes, or until the edges just start to pull away from the sides a little bit. 9) Right when you take the bars out of the oven, sprinkle the chocolate covered coffee beans on top so that they melt into the bars a bit. Cool the bars in the pan on a cooling rack. 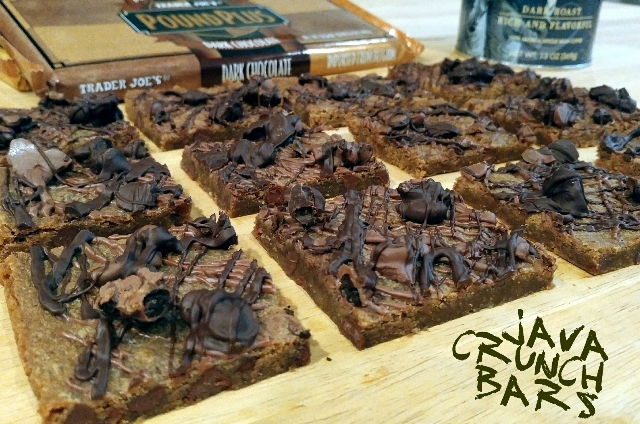 10) While they’re cooling, you can drizzle them with chocolate! This step isn’t necessary, but it does add some extra pizzaz. And extra chocolate, which, let’s face it, is always a good idea. So, let’s do it. I do a drizzle with each milk chocolate and dark chocolate. I do the milk chocolate first, because you can melt it, drizzle it, and then you can melt the dark chocolate in the same bowl and any milk chocolate remnants in the bowl will easily mix it. (Versus if you did the dark chocolate first, and then tried to melt the milk chocolate in the same bowl, the dark chocolate would mix into the milk chocolate and make it darker.) To drizzle, dip a fork in the melted chocolate and waive it back and forth over the bars. 11) Cool the bars completely, then cut & serve!